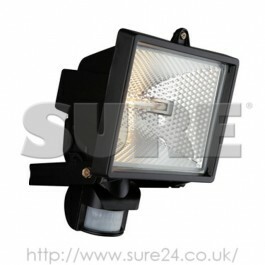 PIR Pemium Security Flood Light 500W. This is a powerful halogen Flood Light that is fully adjustable so light switches on when needed. Built in PIR detects body heat movement within a detection area of 140x12m. Adjustable (Pan & Tilt) PIR detector and floodlight. Adjustable Pan & Tilt with a 13 mtr detection range and 180 degree area of detection. Pulsating LED 'System Live' status acts as advance deterrent. Light 'on' adjustable from 5 seconds to 5 minutes. IP44 weatherproof rating.